There really is no greater place to drink Argentina's most famous export than underneath the lofty peaks of the Andes, and this trip gives wine-lovers the opportunity to not only experience the solar eclipse, but to taste the local specialty in two different wine-producing areas. Blending the intensely Latin flavour of Buenos Aires with the more relaxed and traditional areas around the Northwest, we discover two sides of a wonderful country, from inspirational mountain scenes, red-rock canyons and fertile winelands to the pulsating rhythms of tango found in the streets of the capital. We join the tour in Buenos Aires and check-in to our hotel. Here we find ourselves in the midst of Argentina's capital, located on the southern shores of the Rio de la Plata. Since its founding in 1536 the city has thrived on trade and its streets are filled with an eclectic mix of European architectural styles, with Spanish, French and Italian classicism rubbing shoulders with remnants of Victorian grandeur. Gaining independence from its Spanish overlords in 1816 the city grew to rival the great cities of Europe, its wide avenues and elegant squares earning it the title of the Paris of the South. Today we will discover the city on foot and by bus, exploring the major landmarks around the Plaza de Mayo, site of the famous mass demonstrations by supporters of Juan Domingo Peron in 1945, organised by his wife Eva. We'll also visit the elaborate mausoleums of the famous Recoleta Cemetery, the final resting place of some of Argentina's most revered figures, including Eva Peron herself. Our tour will also take us via Palermo Park and the tango-filled streets of La Caminito in the La Boca district of the city. Settled originally by Italian migrants, the area is famed for its colourful houses and lively street performers. After our city tour we have some free time, which you may wish to spend wandering the cobbled streets of the arty district of San Telmo. This evening we will discover the most Latin of dances during one of the city's famous tango shows, with wine tasting and dinner included. Leaving Buenos Aires behind us we catch a flight to the modern city of San Juan, our base for the next couple of days. Despite being somewhat overshadowed by the fame of Mendoza, San Juan is the second largest wine-producing region in the country, and this afternoon we have the opportunity to visit one of the many vineyards on the 'Ruta del Vino' to try some of the first-class local specialties. A total eclipse of the sun will take place today, July 2nd 2019. We will be driving to a country house approximately 2 hours drive away from San Juan, in an area where the period of total solar eclipse will be at it's greatest duration in Argentina. There will be many other eclipse viewers at this location, including other Explore groups who have been travelling around the country prior to the event, and over lunch we'll be able to share stories about our travels so far. Explore will have a local astronomer with us to provide expert information and to answer any questions that you may have, as well as providing eclipse glasses for you to watch the phenomenon safely. We'll be having lunch at the country house - a traditional Argentinian 'asado' style barbecue lunch, guaranteed to warm us in the Southern Hemisphere's winter months! It will be chilly in the afternoon, so warm clothes are recommended. At this time of year in San Juan, cloud cover is estimated to be at 20%, which is generally classed as on the cusp of 'sunny' and 'partly cloudy', although we are unable to make any guarantees regarding the weather conditions and the likelihood of seeing the eclipse. The Moon orbits the Earth almost 13 times a year, and an eclipse happens if it lines up exactly with the Earth and the Sun. Solar eclipses occur at New Moon, when the Moon is between Earth and the Sun. Lunar eclipses occur at Full Moon, when Earth is between the Sun and the Moon. A total eclipse of the sun occurs when the moon appears the same size as the sun, thus completely obscuring the light. Eclipses do not take place every month because the orbits of the Moon and Earth are tilted at an angle. Most of the time, the line-up is not precise enough for an eclipse. When an eclipse is total, the solar corona can be seen as a white halo around the black disk of the Moon. Near the beginning and end of total and annular eclipses, the thin, visible slice of the Sun appears broken up into blobs of light. These blobs are called 'Baily's beads' after the British astronomer Francis Baily. They happen because the edge of the Moon is not smooth but jagged with mountain peaks. When just one bead is visible, the effect is often likened to a diamond ring. The eclipse will take place at approximately 4.25pm, after which point we will return to our accommodation in San Juan. This morning we drive north of San Juan to Ischigualasto National Park. Popularly known as 'Moon Valley', this park, together with its neighbour Talampaya, was granted UNESCO heritage some years ago. The hike to Cerro Morado Hill will take us to many balcony-style look out points with excellent vistas across the whole valley. The round trip hike takes approximately three hours, and there is a moderate 400m climb up to the top of the hill, with chances of spotting centuries old plant life, unique to the valley. We will also explore the unique rock features found in the park, by bus, before heading to our accommodation in Villa Union this evening. Another other-worldly landscape awaits us today as we drive to the magnificent Talampaya National Park. Once the kingdom of dinosaurs, this park, along with its neighbour, Ischigualasto, contains an important number of fossils, providing a sequential record of life through the Triassic period. The scrub desert boasts fossilised remains of a wide range of indigenous animals and plants from roughly 250 to 200 million years ago. Even for those amongst us who are not scientifically-minded, the park is an impressive show of geological wonders.The main attraction is the canyon, an imposing red rock trench carving through the desert floor. From here we can observe the oddly shaped rock towers with evocative names such as the Chimney, the Monk, the Elevator and the Cathedral - more akin to a Martian journey than our expectations of Andean scenery. This evening we drive back to San Juan for a final night there. This morning we set off on our 8 hour drive to Mendoza via Leoncito National Park. The national park is a protected area with very strict regulations on air pollution, and due to the quality of the atmosphere it is also an important centre of astronomy. In fact, the whole area around San Juan and this section of the Northwest is renowned for its clear skies, and is therefore a fantastic place to see a solar eclipse. The highlight of the park is the observatory, and there are also many trails around the rocky terrain and across the streams of the park, amid herds of guanacos (a smaller relative of the llama) with outstanding panoramas of the Andes mountains. Our Explore Leader will discuss the options on our arrival, and whether it's a visit to the observatory or a longer hike, this is a great landscape to explore. We arrive into the beautifully located city of Mendoza in the evening, with its incredible backdrop of the mighty Andes mountain range. No doubt Argentina's famous steak will be on the menu for many! We spend the morning exploring the city on foot, including the sweeping views from the Hill of Glory (Cerro de la Gloria), which commemorates the Army of the Andes' successful defeat of the area's Spanish rulers in 1817. Mendoza is a great place to try some of the local delicacies - alfajores are an Argentinian staple, a cakey biscuit filled with 'dulce de leche', perfect with an afternoon tea or coffee. We may even try mate - a bitter green tea drink that takes centre stage in most Argentinian social gatherings. Our afternoon is spent 30 minutes outside of Mendoza city in Lujan de Cuyo - a wine growing region where row up row of vines grow in neatly ordered lines under the shadow of the Andes mountains. Drinking wine in this landscape is an unforgettable experience, and today we will be jumping on our bikes and enjoying a leisurely (and flat!) cycle between some of the region's wineries. Although this area is home to many varieties of white, it is mainly known for its reds, particularly the famous Malbec. After enjoying the wine we head back to the city for the night. Today we have a full day trip to the beautiful Aconcagua Provincial Park, home to the magnificent Aconcagua - standing at 6961m it is the tallest peak in the Americas. At the bottom of the permanently snow-covered peaks we find lush meadows and some forested valleys, and our Explore Leader will take us on a short 1.5hr hike to the Horcones Lagoon, a glacier fed lagoon with outstanding views of the mountains. The trail is relatively flat and rocky, with mountains looking at either side of us and the peak of Aconcagua rising before us in the distance. Before returning to Mendoza, we also make a stop at the Puente del Inca, a geologically formed bridge once allegedly used by Incas to cross the river. The reddish oranges of the formation are caused by the minerals in the waters running beneath the bridge, and the remains of a slightly curious-looking stone chapel are still found built into the rock. We take a flight this morning back to the hustle and bustle of Buenos Aires, which will be a huge contrast from the quiet and open landscapes of the Andean region. This afternoon is free to spend more time in the city - there is much to enjoy just wandering around the districts like La Boca and San Telmo, and you could also taste some of Argentina's most mouth-watering traditional food at one of the city's many parrillas (grills). Choripan comes highly recommended - a large chorizo in a homemade crusty bread roll, covered with spicy chimichurri sauce. Delicious! In the evening we can get to know something of Buenos Aires' dazzling nightlife. Today we have a full free day to spend time discovering more of one of South America's most captivating cities. Alternatively, you can escape the city with a trip to an estancia (ranch) or take a boat trip on the Tigre delta, a fascinating insight into the manmade communities and stilted homes set around this swampy river. Our trip ends this morning in Buenos Aires. June is the winter season in Argentina, so you should expect cold, crisp and mainly dry days, and pack accordingly. The sun can still be strong so sunblock is recommended, particularly in the national parks, as well as a rain jacket and sturdy shoes to walk in. On the eclipse day you will be outside with the astronomer for part of the day, so pack a thick jumper in case you become cold. Eclipse glasses will be provided for you in Argentina. In San Juan you will have 3 nights in a hotel made up of differing cabins and rooms. Here you may be in a studio apartment, a double room or a small cabin. This is the best available place to stay to see the eclipse near San Juan. Citizens of the UK, New Zealand, Australia, Canada and passport holders from several EU countries can enter the United States without a visa under the Visa Waiver Program (VWP) - where you apply for an ESTA (Electronic System for Travel Authorisation), which applies if you enter the country by sea or by air. This must be done on line - https://esta.cbp.dhs.gov no later than 72 hours prior to travel. Travellers who have not registered before their trip are likely be refused boarding. When completing an application for transit you should enter the words 'In Transit' with your final destination location in the address line. Please note that if you have visited Iraq, Syria, Iran or Sudan since 2011 you cannot travel with an ESTA and instead you will need to apply for a visa from the nearest US Embassy or Consulate. If you are unable to provide a valid visa before boarding flights to the US, or entering via another method, you may not be permitted to travel. 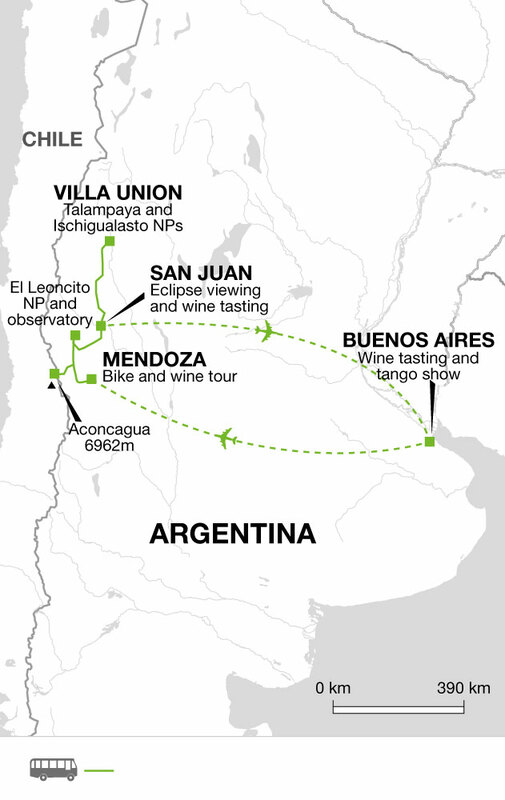 Join a local astronomer to view the total solar eclipse from San Juan, and enjoy three different opportunities to taste Argentinian wine beneath the wonderful setting of the Andes mountains. This trip is ideal for active people who want to combine some city sightseeing and cultural discovery with walks amid some of the world's most inspirational scenery.